Today is Sunday. The day off for most people. I am working between 65 and 70 hrs a week. I don't have to worry about what is for dinner. I don't have to commute to work except out to the field. It is a managable lifestyle. You give up freedoms and privacy to be in the program. You gain insight, expererience and a whole lot more. Everyone here is a character. It is not uncommon to be having a dinner conversation with someone who is working as a General Assistant (GA) who has advanced degrees or has sailed around the world or both and more. Tales of ship wrecks, travel in Mongolia and life in remote Montana or Romania is all pretty much normal. Today I donated my Grandfather's book to the McMurdo Library. It is a translation of Immanual Kant's "Anthopology from a Pragmatic Point of View" from the 1700's. As far as I know it is the only translation. It is a mix of personality profile, pyschology and philosophy from the author who brought you "Critique of Pure Reason" and "The Categorical Imperative", or as I might call it "Pitfalls of the Golden Rule". The library is very eclectic as you might imagine. The book will be safe here and I am sure someone will find it insightful. I find that to be a good notion when you are leaning over the lip of a mountain top in Antarctica working on radio equipment. I am very careful. I am not very anxious. That only detracts the brain from the work at hand and being careful. I noticed yesterday my flight weight is 33 pounds greater than my body weight. I am wearing 33 pounds of clothes out in the field. 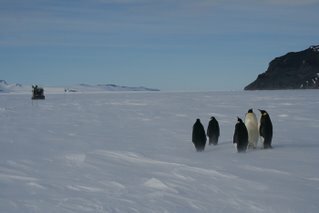 The pictures are of the very crowded ramp on the Pegasus Ice Runway as I flew over in the A Star Helicopter and some Emperor Penguins shot by some other folk on station. I went up to Mt Coates yesterday. The system is all tested and back up and running. I asked for close support with the helo since I knew it wasn't going to take me too long to get system going again. The pilot agreed. So we landed, turned off the machine and he enjoyed a bit of a break. Saturday is dress down day for the pilots. I had him pose with his jacket open so you can see his Hawaiian shirt. The weather was closing in on us. The ceiling was coming down fast so it was pretty good that we got in and out. Our flight plan was for 2 hours on the deck. I think we finished in about 20 minutes. The Eurocopter AS 350 is a 3-bladed machine that is pretty sporty. I sat in the front seat and the visibility is great. I am a lot less intimidated by the prospect of flying a helicopter now after technical discussions with the pilots. You do have to "fly" a helo all the time for the most part compared to a fixed wing. I spent the rest of the day working on a cross-band UHF-VHF repeater system in the shop that will go up on mountains on this side of the sound. The picture shows what you might think is a freezer door. Wrong. It is common to use these freezer doors as entrance doors to buildings. This is (as marked) the exit. Specifically, this is the door in the helo pad briefing room. The doors open in rather than out so you can open them after a herbie (Hurricane Blizzard) comes thru and piles snow around the buildngs. The other picture shows Mt. Coates on our approach. Look closely and you will see the repeater on the left newar the point. We have two repeaters up there all powered by solar. The pole flights finally got through. They were 10 days later than expected. I bet the polies were happy to see the plane land and the fresh fruits and veggies (freshies) Last time a plane landed it was in February. The flights also happened to occur on the 50th anniversary of flights to the pole (to the day) when the first southpole station was started. The picture is from a recce flight from Taylor dome. I will probably be going out there on the 18th or so. I have been warned already that I need to expect to be cold. I will be camping. I just checked the helo schedule. It looks like I am headed to the top of Mt. Coates tomorrow. Should be good for photos. Today I worked on radios for some heavy equipment, some Cat 95 Tractors and and a D8. When I was in the heavy shop I also stopped and took a shot of the 1957 Tucker sno-cat that a Guy I know is rebuilding. These machines are pretty neat. This place does get you tired. The cold, the sun, the atmosphere. I have yet to see a single person with a bad attitude. The buildings are all heated well, actually too well when you have 3 layers on after you take off big red. In the picture you can't tell the wind was about 30 or 40 knots and about 10 below zero. It wasn't bad. I am getting used to it. Dress in layers and regulate your body heat. It takes almost constant attention to keep your temperature comfortable. I spent a couple more hours in the ham shack last night. Almost is the word. 20 meters isn't working for me. I think I have antenna problems. I did string a 40 meter dipole and I heard folks for the US (NY, OH, and some others). I rigged up the 400 w amp and still couldn't break thru to give a point or two (perhaps a multiplier) to some contesters. I suspect if I had a kilowatt I would have been there. It was close. So, the next time I go up to the shack I should be in business. It is fun talking to some of the guys down here about how terrible it is to be at the pointy end of a pile up... I just pick on them when they start talking like that. Today I was out on the sea ice. I spent quite a bit of time in a Hagglund, a Swedish made tracked vehicle. I learned how to profile ice with a power auger, determine if cracks are safe, and generally assess ice conditions. It was informative and enjoyable. Some of the folks I live with down here are an absolute hoot. They are so much into the adventure (just like me) and they are in the zone. I was hoping to get a shot or two of some penguins but it was not meant to be today. We did see some more Weddell Seals. Overall, the ice is interesting. It is like the sea. It moves slower and has a different rheology. The dangers and the respect remain the same. Still no flights to the pole. Nine days it has been contrary to plan. That a long time out of a season as short as summer in Antarctica. The station is at or near maximum capacity now. There have still been no trips to the pole and all the folks for the pole are here. It is crowded. You have to plan when you do things to make sure you can get them done such as laundry. I hear that we are getting at least 3 trips to pole tomorrow. That will be good. It has been unseasonably cool at pole. The rule is that the LC-130s don't land when it is colder than -50 F. It has been -60F at the pole all last week. Cool indeed. Here is a picture of me struggling with the Antarctica climate at Gallager's at McMurdo. It is a non-smoking bar. The folks who tend bar are moonlighters. They have regular station jobs but also tend bar for minimum wage. The other picture is after the halloween party at about 11:30 PM. This is sea ice on the Ross Sea. This ice will break up and ships will come in this area in February. Right now they are landing C-17s LC-130s, Twin Otters and Baslers (turbine powered DC-3s) on the ice runway. The runway will move to Wiley field in a couple of months. Wiley is on the "Permanent" Ice Shelf. It is all pretty impressive especially when you realize we have a Microwave Landing System out there for ultra precision approaches. Better equipment than almost every airport in the US. I got on the air (40 meters and 20 Meters) a couple of hours ago (0300 UTC). I did not make any contacts. However, 20 sounded like it might be opening up. I am going to go back up there in a little bit and try again. We have established a Ham Radio club. We had our first meeting this morning.